If you are going through your options for High Definition TV systems, don’t order those expensive Pro:Idiom Hotel TVs before you read this article. Why Is Your Brand Recommending Pro:Idiom™ TVs? Some hotel brands, including most of the larger chains like Hilton®, Marriott®, Choice® and Wyndham® are recommending Pro:Idiom™ TVs because of Digital Rights Management. With the advent of digital HD broadcasting, piracy of a programming became a serious issue for TV providers like HBO, Showtime, ESPN, and Disney. 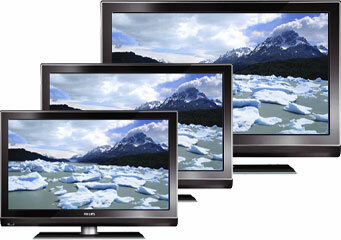 The digital broadcast is a perfect HD signal and if left un-encoded, is very easy to copy. Like CDs and DVDs, broadcasters had to find a way to protect their signals from piracy. The solution was digital rights managements systems like Pro:Idiom from LG and Veramatrix. Digital Rights Management systems protect the investment the broadcasters have made in bringing you the programming your hotel guests enjoy. Digital broadcasting has created a need for additional hotel TV system hardware and specialized TVs in order to encrypt and deliver the digital signal over your hotel’s wiring and then decode those HDTV signals in the guest room. Digital Rights Management has increased the related costs for the hotel. In addition to the increased equipment and installation costs at the hotel television system headend, pro:idiom TVs can cost as much as 20% more than a equivalent quality commercial hospitality TVs and even more than the consumer HDTV you can purchase at Costco or other retailers. With OTA’s and competition eating into hotel margins, higher hotel television costs can eat into your profits. The most common option to Pro:idiom encoding and TVs in HD hotel television systems has been the same option cable providers are forced to use, set top boxes. Set top receivers give your hotel the full programming package, sometimes as many as 160 channels, for the same programming costs as you would pay for the limited (typically 24-48) in a head end type system. While many independent hotels have went this route in an attempt to save money on equipment and installation, the major hotel brands and chains have not made this their brand standard this for a number of reasons. The number one reason is the ugliness of the large set top box cable companies use. The second reason is security. Set top boxes are easy to steal if they are not securely mounted. Large set top receivers also take up space on the desk or dresser. 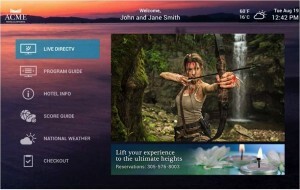 DIRECTV heard the hotel brands and independent owners complaints about the costs of Pro:idiom and ugly, easy to steal set top boxes and has come up with the perfect solution – the DIRECTV Residential Experience for Hotels. 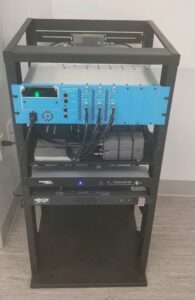 With the DIRECTV Residential Experience or DRE, there is no need for additional encoding and decoding equipment in your hotel headend system or for expensive pro:idiom TVs for your guest rooms. The DIRECTV DRE system works like an l-band tv system with a the full package of channels being delivered to the guest room via a receiver in each room. The DRE solves the problem of expensive Pro:idiom TVs, by allowing you to use any flat screen HDTV. We recommend that you use a commercial hospitality TV in order to lock controls on the TV and for durability, but any HDTV can be used. So if you have already been pricing TVs at Costco, other than the lack of warranty once installed in a commercial establishment, those TVs will work fine with your new DIRECTV Residential Experience system. The DIRECTV Residential Experience solves the issue of ugly cable set top boxes by providing receivers that are about the size of a small book and can easily be securely mounted behind the flat screen TV on the wall or behind a desk or even on the TV itself. The bottom line is your bottom line, The DIRECTV Residential Experience can save you hundreds of dollars per room while providing your guests with a superior TV experience. For a 200 room property, a $150 savings on a 40 inch HD TV alone means a $30,000 smaller capital expenditure. A less complicated installation gives you even more savings on your installation. Factor in zero upfront costs on the DIRECTV equipment for the DRE system and you have the perfect system for your property. If you are in the process of upgrading your hotel system and have been told that the brand standard for your brand is Pro:idiom, tell your hotel brand that the DIRECTV Residential Experience should be the new Brand Standard. The DIRECTV DRE will save you money and provide your guests with a superior TV viewing experience.